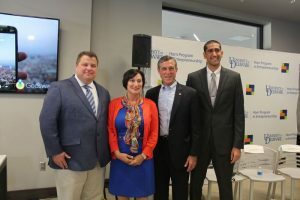 Photo Caption: (L to R) Ray Bivens, Delaware State Parks Director, Linda Parkowski, Delaware Tourism Director, Governor John Carney, Jason Bamford, GeoSwap Founder. Newark, Del. – It is now easier than ever before for Delaware visitors and residents to find nearby fun events and activities year-round. At a news conference Tuesday morning, Governor Carney joined the Delaware Tourism Office (Visit Delaware) and State Parks in announcing their new partnership with Geoswap, a location-based mobile application. Geoswap was founded by students in the University of Delaware Horn Program in Entrepreneurship. It is a smartphone app that engages and entices users to visit locations and share their experiences by navigating them to events and activities in their proximity. The new partnership adds geo pins branded with Visit Delaware and State Parks logos to the app. This will help visitors and residents identify must-visit locations and must-attend events, which will keep them engaged while in market. Jason Bamford, Jordan Gonzalez and Keith Doggett came up with the idea for Geoswap in the dorms at UD more than two years ago. The app will help people escape so-called FOMO (fear of missing out) by making sure they are aware if something great is happening right by them. The young company and its team have been steadily gaining momentum recently. Two weeks ago Geoswap came in first place at Hen Hatch and was awarded $21,000 in prize money. Geoswap was also a finalist last month at e-Fest, a celebration of student entrepreneurship hosted by the founder of Best Buy. Information from Visit Delaware and State Parks is available on Geoswap now. The app is free and can be downloaded from the App Store or Google Play.